Emily and Victor’s story wasn’t actually one of love (or in any case, it isn’t their love for each other). Emily loved the idea of getting married and Victor loved his fiancée (who was not Emily). A chance meeting accidentally got Victor married to the already deceased Emily and both had to go on adventures to get Victor safely back to his beloved. Emily’s skin is already tinged blue since she’s already dead. She wears a billowing white wedding gown with a sweetheart neckline and long blue hair is framed with a long, lacy veil. Victor looks pale and gaunt, true, but his Victorian-era outfit looks dapper and very gentleman-like. Here’s everything you need to look like Emily and Victor. 1 White Sleeveless Gown Emily died in her wedding gown shortly before getting married to her killer. 2 White Heels A pair of white heels is perfect footwear for a wedding gown. 3 White Lace Veil Wear a white lacy veil as part of Emily’s wedding look. Don’t forget the dead flowers on top of her hair. 4 Dead Bouquet Hold a dead bouquet of flowers since Emily’s has long-died. 5 Blue Wig Get Emily’s iconic hair with a blue wig. 6 Light Blue Body Paint Paint your body a light blue shade to get Emily’s deathly pallor. 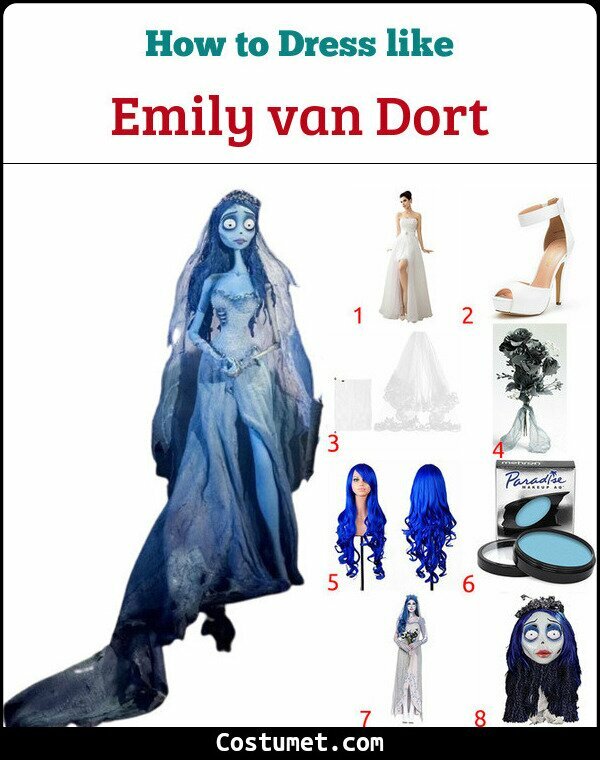 7 Full Costume Set Transform into a corpse bride with this costume set. 1 White Dress Shirt Victor wears a white dress shirt and a blue cravat underneath his vest. 2 Brown Tailcoat Wear a brown tailcoat to go with the times. 3 Brown Pants Wear this smart pair of brown pants to look like a respectable gentleman. 4 Brown Oxfords A pair of brown Oxfords look chic and put-together. 5 Light Gray Body Paint Part of the film’s allure is its sepia-ish color grading, so Victor’s pale skin looks light gray. Paint your body that shade to get the details perfect. 6 Black Wig Use this black wig to achieve Victor’s hairstyle. 7 Full Costume Set Get the gaunt look of Victor with this costume set. Emily and Victor are both played by highly celebrated and versatile actors, Helena Bonham Carter and Johnny Depp. Carter and Depp are well known for their solo acting careers but they have also acted together numerous times in movies like Sweeney Todd and Dark Shadows.